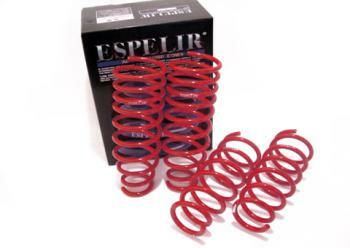 Espelir Springs - Active GT - Dezod Motorsports Inc - Home of the automotive performance enthusiast since 2002. ESPELIR Active GT Springs were developed to satisfy the performance driver that wants to extract the best performance out of his vehicle. This spring empowers a higher spring rate than the Active Super Down Springs and has a 30% higher grade stroke volume. Keep proper stroke during compression. No loose spacing between the spring end and spring perch. ESPELIR products utilize SAE9254 and new material SAE9254MHT (Vanadium mixed material) under strict quality control during all aspects of manufacturing – during heating of material, cooling, and winding to ensure proper stroke volume and spring lightness. For surface coating methods, we use 3 steps of shot peening to ensure super durability of the spring. Finally, epoxy resin power coating is the finishes off the look in signature colors.